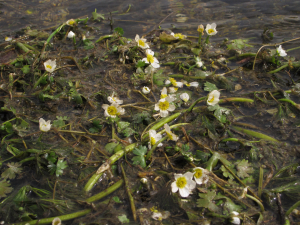 Observation - Common Water-crowfoot - UK and Ireland. Description: Aquatic in shallow river with 5 white petals and numerous yellow stamens, leaves very finely dissected below the water line and lobed above the water. Aquatic in shallow river with 5 white petals and numerous yellow stamens, leaves very finely dissected below the water line and lobed above the water.